Having that in mind, just after two years from the commencement of operations in Poland, under the continuous improvement strategy and promotion of its products, Mando Poland implemented in 2013 EFQM (European Foundation for Quality Management) Excellence Model in a purpose of continuous improvement, satisfaction enlargement of current Customers and acquisition of new European and global Customers; but the most important purpose was to ensure Company’s development with a focus on sustainability and security of Mando Corporation Poland future. Acknowledgement of Company`s performance in accordance to EFQM Excellence Model can be seen by acquisition in 2015 Polish Quality Awards, in 2016, EFQM 5 Stars Award, - Company was recognised, by the EFQM Assessors, as an excellence one and in 2017 Mando Corporation Poland has been nominated as a finalist in European Quality Award. 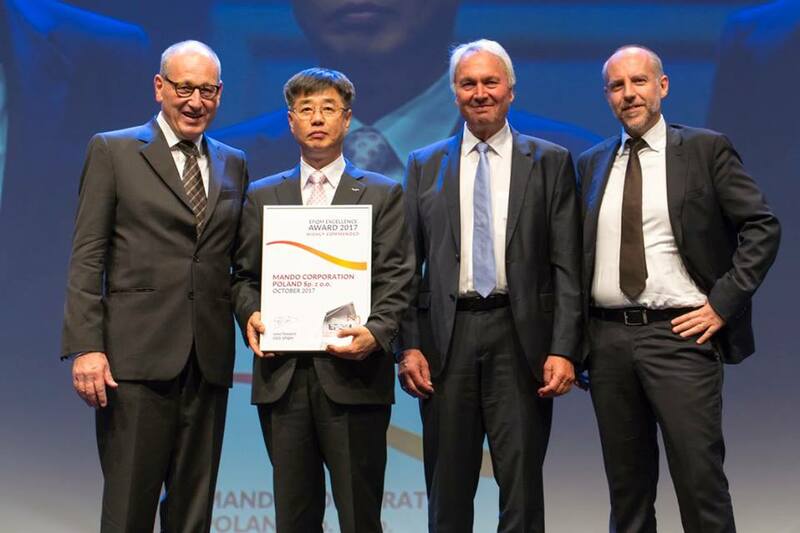 On 26th of October 2017, during EFQM Celebration Gala in Alcobendas (Spain) Mando Poland received Highly Commended Award, which was given to Mr. Hee Man Shin, President of Mando Corporation Poland. Acquisition of such a prestigious award, confirms only, that automotive components produced by Mando are on the highest, global quality level and experience gained so far as also continuous improvements politics puts this supplier as a leader in the calliper production. EFQM Excellence Model was created 25 years ago and its main purpose was to increase competitiveness on the world market. At the core of model are eight principles that defines excellence and establishes direction for companies that want`s to self-improve and they are as follows: Adding Value for Customers, Creating a Sustainable Future, Developing Organisational Capability, Harnessing Creativity & Innovation, Leading with Vision, Inspiration & Integrity, Managing with Agility, Succeeding through the Talent of People, Sustaining Outstanding Results. Mando Corporation Poland Sp. z o.o. was established as a first in Europe, company-daughter of Mando Korean concern. Company operate in Poland in Wałbrzych Invest-Park SEZ subzone from November 2012. Currently Mando produces such components as: shock absorbers, calipers and steering columns. Its main Customers are Kia, Hyundai, VW i FCA. Company employs 540 employees and that number will rise up to 800. Mando Corporation Poland has IATF 16949, ISO 14001, ISO 18001, ISO 27001 certifications. Up to now Korean concern invested in Poland 111 mln euro.